Janice Heskett and her daughter Danielle who opened the popular Churchfield Road cafe deli about a year ago have been planning to move for quite some time. They have been waiting patiently for things to be ready at their new premises - a little further West at 100 Churchfield Road. Their expanded business will be taking over half of the site formerly occupied by the Coyote - to include the courtyard at the back. This is really good news for the many customers who have been turned away because there are so few tables in Vanilla. They would like to warn customers that they will be closed for a while. The supply of smoothies, sandwiches and coffee which have become a crucial part of Acton Central life will be temporarily interrupted. The old Vanilla's last day of trading at the present site will be May 26th. 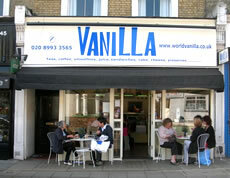 They will then be closed for about 3 weeks before the new improved Vanilla opens. Information will be available on ActonW3.com as soon as they know exactly when their new cafe deli will be opening. Delivery of veg boxes will continue as normal.